It was his spirit of collaboration and friendship that first brought my father to the italian coastal town of Albissola, just west of Genoa. in the 1950s the Danish artist Asger Jorn had moved there for health reasons; he had tuberculosis and was told he should live near the sea. My father had been introduced to him by André Breton in Paris sometime before the war and liked him very much – he was quite a character, very fiery. 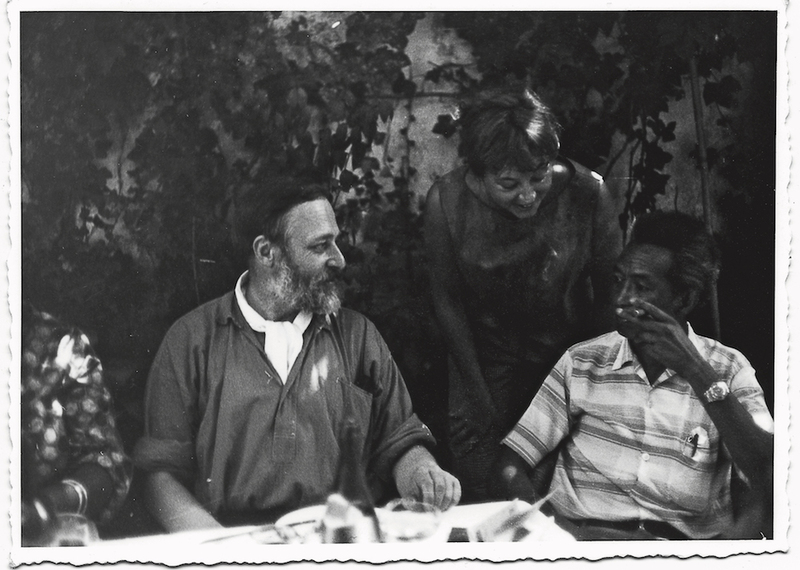 Then, in the summer of 1954, Jorn invited my father, along with other artists including Karel Appel, Corneille, Sergio Dangelo, Lucio Fontana and Roberto Matta, to participate in an International Ceramics Meeting he had organised with Enrico Baj at the studio of local ceramicist Tullio Mazzotti. 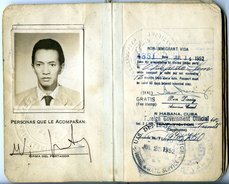 Wifredo was in Cuba and received the invitation late, but he visited Albissola about ten days after the event and liked the town so much that he and my mother returned several times over the next few years, eventually buying a house there in 1961. Albissola, a traditional centre of Italian ceramics, was a hub of excitement, activity and artistic exchange at the time my father was there. My mother called it ‘Albissolamania’. She remembers one occasion when Baj and Dangelo, together with Fontana, Roberto Crippa and Piero Manzoni, came to welcome them off a train from Paris, reciting poetry and handing them enormous panettoni. They were thrilled, but also rather embarrassed. Like the rest of Italy, the town was still recovering after the war and people lived very simply. Artists would pay for the use of the local studio Ceramiche San Giorgio – and meals in restaurants – with their creations, while those passing through on their way to Rome or further south would make a series of ceramic works, leave them to dry, and come back to see the finished product a week later on their way back up country. It was in those early days that Jorn introduced my father to ceramics, each decorating a face of the same vase in their own style. 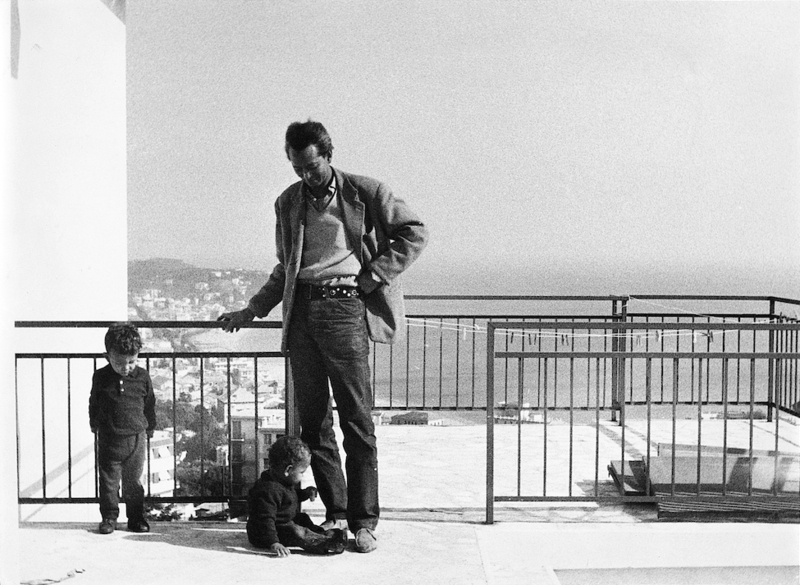 After years staying with friends such as the Crippas, visiting nearby Rapallo where Baj was also working with ceramics and renting an apartment near Jorn’s, my parents bought a half-built house on a hillside in Albissola whose owner could no longer afford to continue the project. My father added a new wing which became his studio. It was about six or seven metres high and had a huge window all along one side that overlooked the bay. I remember that I wasn’t allowed to play in there. He had large speakers with the music on full blast while he worked, and a fridge for cold drinks. no alcohol, though; he drank very little. 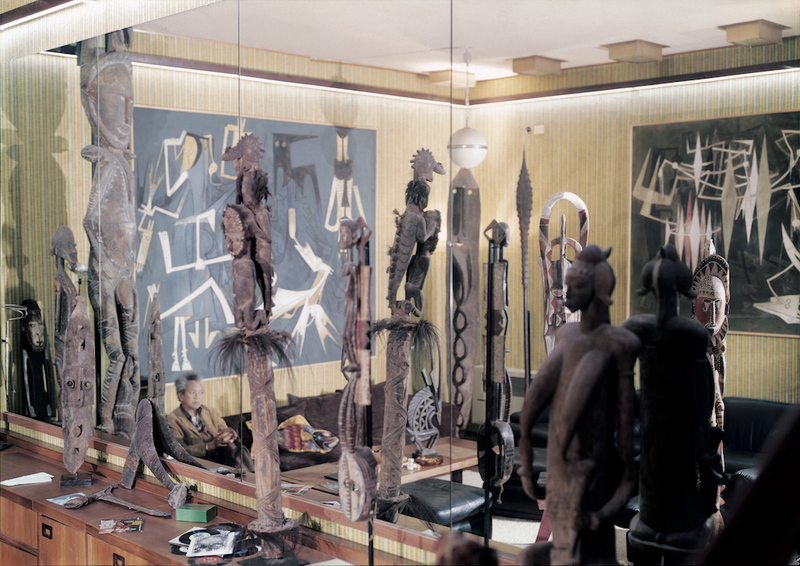 There’s an old photo which shows him in the downstairs music room, surrounded by his collection of Baule and Dan masks and totem poles from New Guinea, many of which he bought in Milan while visiting Giorgio Upiglio, a master printer at the Grafica Uno workshop. He loved them. In 1938 he had been particularly struck by a mask of a horse’s head in Picasso’s studio, but some years later wrote a letter in which he lamented how terrible it was to see these pieces being bought by people who had no clue about where they had come from, and who showed them in a way that stripped them of any context. In the same way that black bodies had a history of being exploited, he saw this as an exploitation of the black soul. He wanted to give his objects some dignity, so he put them all together, in conversation, speaking to each other. Wifredo moved to Albissola permanently to work, while my mother, brothers and i stayed in Paris. She wanted us to go to French schools and felt that the Italian town, while wonderful to visit when the weather was nice, could be rather dreary in winter. My father came back to visit regularly and often sent us letters illustrated with animals and creatures of his own invention. He would draw himself and invent little characters for each of us. Every summer we would all travel down to Albissola. Adelita, our babysitter and a kind of grandmother figure, was always with us. She was a brilliant photographer who would carry cameras and lm for my father on trips out together. She would also do some of the cooking and help my father in the kitchen. He was a very good cook, capable of preparing a meal for any number of people who might show up unexpectedly at dinner time, making do with whatever was in the kitchen and fridge. In 1973 he even won first prize in the local competition Pittori in cucina – Painters in the kitchen – for his minestrone! On my visits I saw big paintings such as At the End of the Night 1969 going from their beginnings – a white canvas with charcoal outlines – to something fully realised. The last large-scale painting I remember he made was in 1970, The Abalochas Dance for Dhambala, the God of Unity. Then, in 1975, when he took up ceramics more seriously, he would work closely day after day with the ceramicist Giovanni Poggi. Sometimes he wouldn’t sleep at night, anxiously anticipating what the results of his efforts might be. After spending the day on the beach I would swing by the workshop and could tell immediately, from his mood, how his work had gone. Something might have cracked in the kiln, or the glazes might have run the wrong way or mixed with one another to create an unexpected colour – sometimes welcome, sometimes a disaster. He may have disliked what he had pulled out, or he would change his mind two days later. 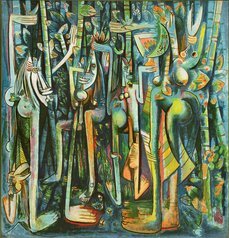 His art from this time is a little overlooked in comparison with his painting from the 1940s, such as The Jungle 1943. Working enthusiastically across different media, maybe the later works are more difficult to analyse and pigeonhole in any particular style. 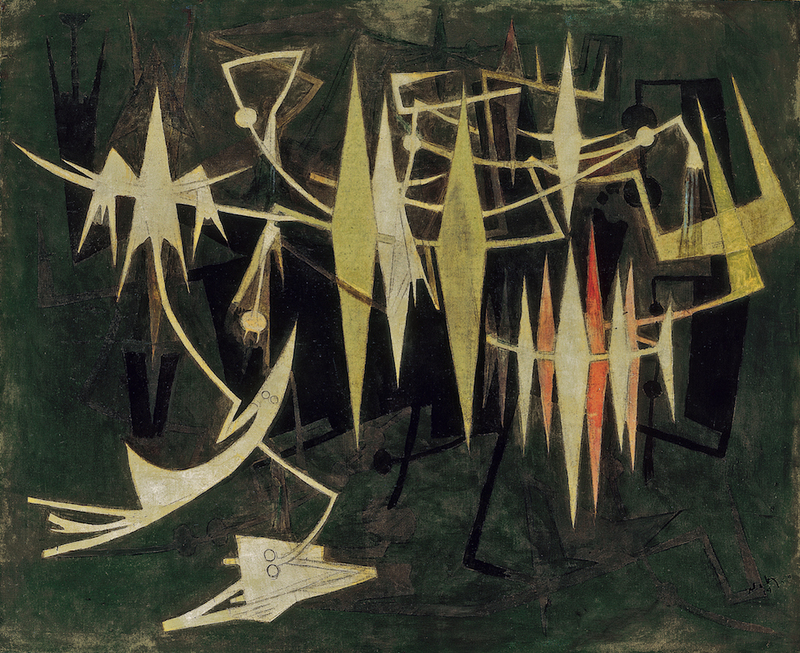 While cubism and surrealism were essential to the development of his style, his painting was always something on its own, and even more so in the later years – the work is more abstract, the hybrid figures more menacing. Throughout the 1940s his figures had already begun to singularise themselves, the compositions becoming less dense and individual figures coming to the fore, while his backgrounds had started to recede or fade. In the 1950s this process continued, and by the time he’s in Albissola, you tend to see monochrome backgrounds with hardly any detail, often just a simple wash – everything becomes concentrated in the line. In 1958 he met Upiglio, and all of a sudden he threw himself into a medium in which this approach could be taken another step further – that of printmaking. in the resulting graphic work, his recurring crescent moons and breasts become even sharper, even more angular. Poetry had always been important to my father and his work, and many of his early paintings were given titles by the likes of Breton or Paul Éluard. but in the 1960s, through printmaking, he was really able to enter into sustained conversations with poets. With the family back in Paris, he would frequently travel up to Milan and spend a week or so at a time working with Upiglio. 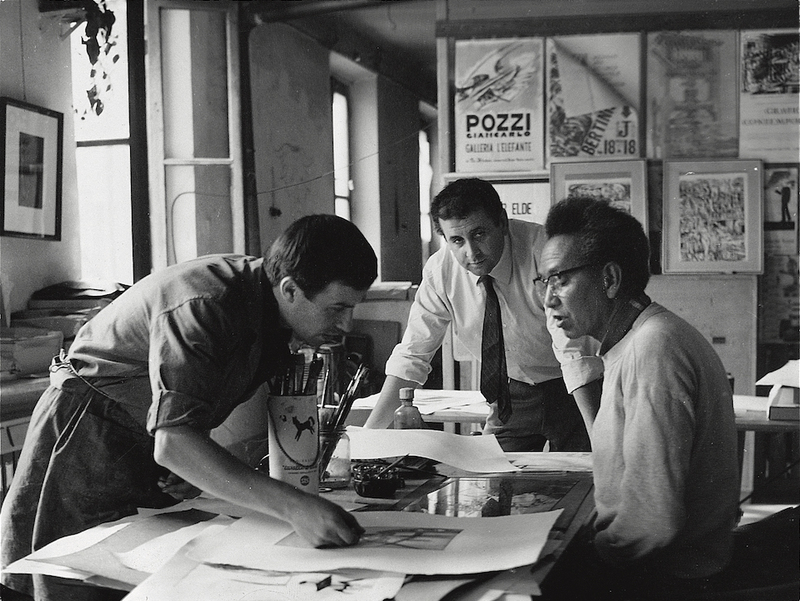 People were always passing by Giorgio’s print studio and he enjoyed the vibrant atmosphere and his encounters with other artists there. 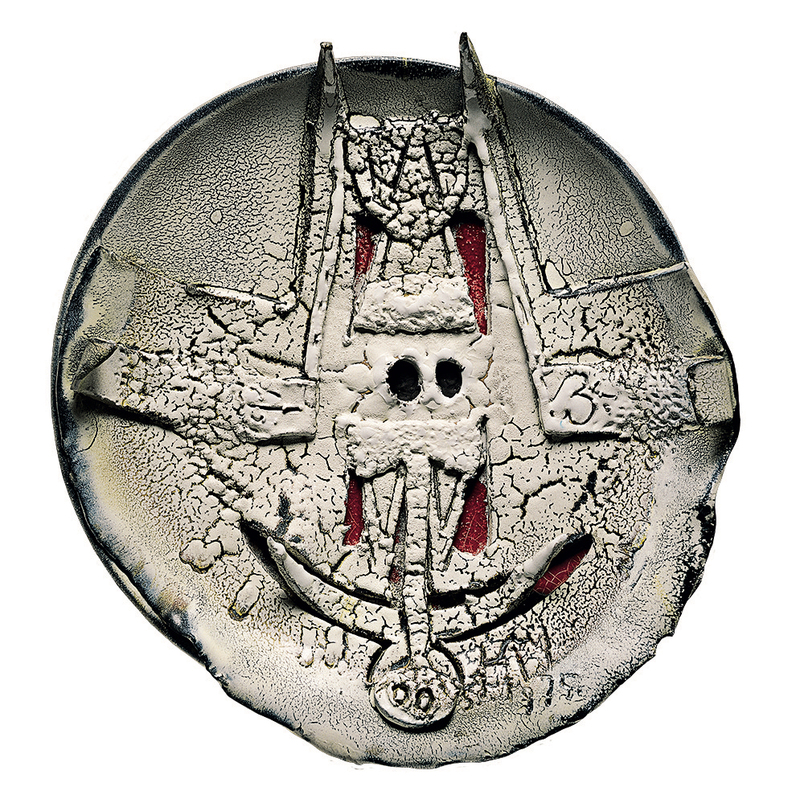 Some of the book projects he worked on – such as Apostroph’ Apocalypse 1966 in collaboration with the Romanian poet Gherasim Luca – took several years to complete, with the texts changing to relate to the etchings my father made, or the etchings being reworked according to the texts, as well as the possibilities available to him at the press. 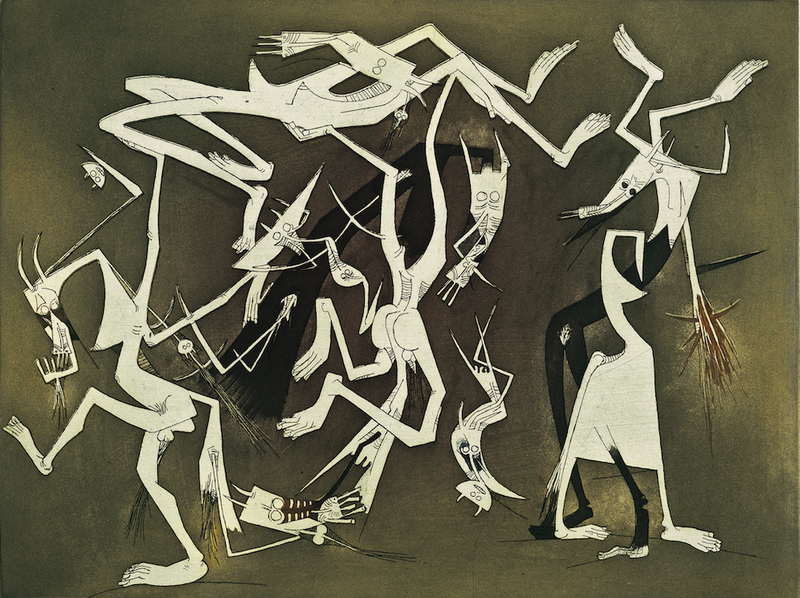 When preparing the plates for Annonciation 1969, a collaboration with his old friend Aimé Césaire, he left some of his figures completely blank, so that, when printed, the paper shone through them bright white – the culmination of a technique he first explored in his paintings from the 1940s, where he left parts of the raw canvas visible as a way of highlighting his forms. Albissola holds a very special place in my memory. It was a place of meetings between friends, artists, writers, poets, all in lively discussion – a place of true creativity. The boardwalk along the beach, still there to this day, is testimony to this vibrant atmosphere, made of vast ceramic mosaic panels created by the likes of Jorn, Fontana, Crippa, Mario Rossello, Giuseppe Capogrossi and my father. 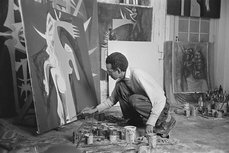 The EY Exhibition: Wifredo Lam, Tate Modern, 14 September 2016 – 8 January 2017. 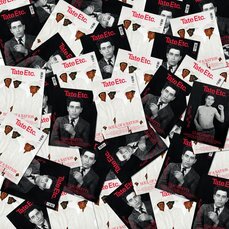 The exhibition is part of The EY Tate Arts Partnership and is curated by Matthew Gale, Head of Displays, Tate Modern, and Catherine David, General Curator, Centre Pompidou/Musée national d’art moderne, Paris, with Katy Wan, Assistant Curator, Tate Modern. Eskil Lam is head of the Wifredo Lam Foundation in Paris. He talked to Enrico Tassi.